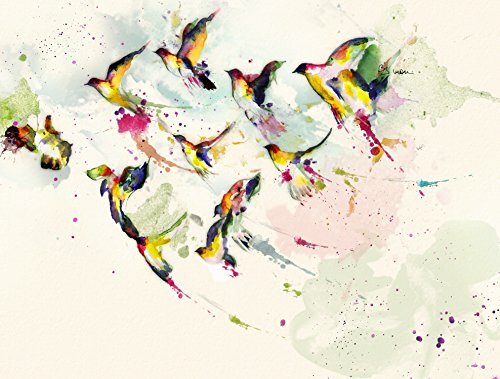 Freedom Birds (Limited Edition on Fine Art Paper - 15x12 in) by at When Art Imitates Life. Hurry! Limited time offer. Offer valid only while supplies last. The digital composition is mounted into Arches paper sticked to a foam mount to 3/16 ultra. Then the image is worked on with acrylics and gels. The digital composition is mounted into Arches paper sticked to a foam mount to 3/16 ultra. Then the image is worked on with acrylics and gels. Mahlstedt Gallery is very pleased to offer limited edition prints on Fine Art Paper of our represented contemporary works of art. Most of the beautiful original work that we show through the gallery can be yours in a choice print, available in a wide range of sizes to fit in your space. Our diverse line of original artwork is professionally printed on museum grade Fine Art Paper that won't fade or yellow. Mahlstedt Gallery limited edition Fine Art Paper prints are produced on our state-of-the-art professional color printer that replicates the finest detail. Our expert printers hand-number and seal every print with the Mahlstedt Gallery seal of authenticity. We roll and package each piece with care and include white gloves, to make it easy for you to maintain and enjoy your beautiful limited edition fine art! Please note, this fine art print does not come framed. Artisan Handcrafted Quality Our fine art limited edition prints are made-to-order by our own expert in house staff, inspecting each piece to make sure it has been made to perfection. We use only premium materials. We love art and care about it!